Get inspired by these simple bathroom organization ideas that leave a bathroom looking uncluttered and clean. The bathroom just seems to be that room that needs organization and reorganization all year long. Maybe it’s because we really use it for a variety of things all day and every day. It seems like once every three months this tiny room can turn into a disaster zone. 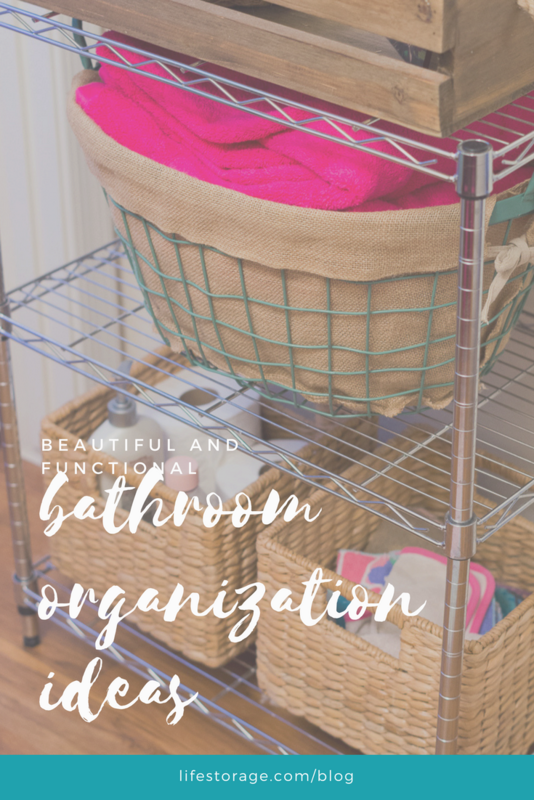 But it’s no lie that an organized bathroom helps your daily routine run much more smoothly. 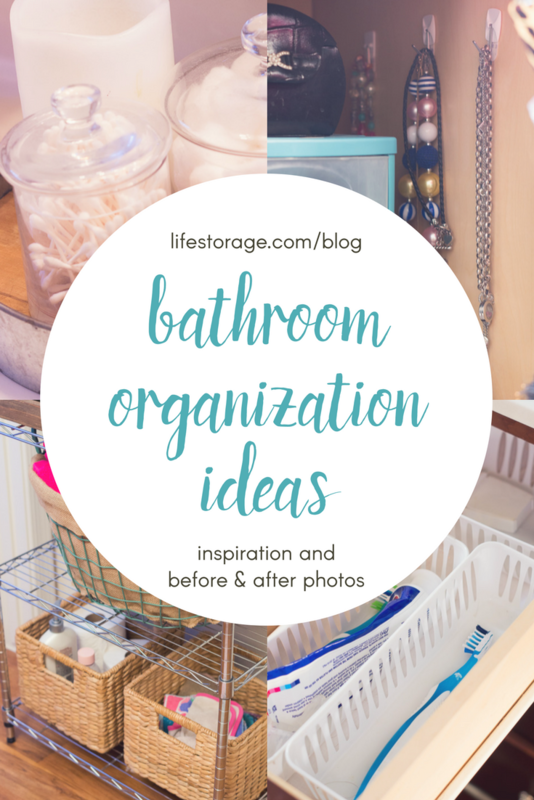 That’s why I’ve rounded up our favorite bathroom organization ideas and hacks–including a few before and after shots of a couple of embarrassing bathroom situations of my own–to get you motivated. Purge! Look in every drawer, cabinet and closet and toss anything that has not been used in the last six month. Check expiration dates on medicines and products. If it’s old and unused, toss it. If it’s something you need, replace it and be ready to have a spot for it. Then, sort! After all the clutter is cleared, take inventory of what is going to stay and sort it into categories. Some common bathroom categories include hair stuff, makeup, medicine, towels, nail supplies and toiletries. Sorting things into categories will help you decide where you should store each and what kind of storage solutions you’ll need. If you are a hair product junkie, it is not all going to fit in one drawer. Getting a good look at all your supplies will help you decide the best way to store it so it’s easy for you to find right when you need it. And finally, clean. Wipe down all products and surfaces in your bathroom. Give everything a clean sweep before replacing any items. 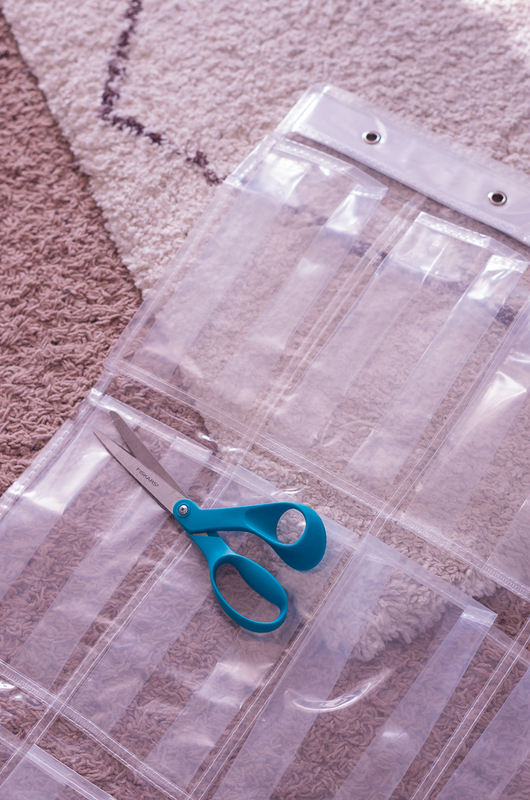 Lay down liner paper or fabric on the bottom of shelves so you can clean it easier in the future. Now we’re ready to start implementing a few new bathroom organization ideas! There is lots of space to take advantage of under the sink. 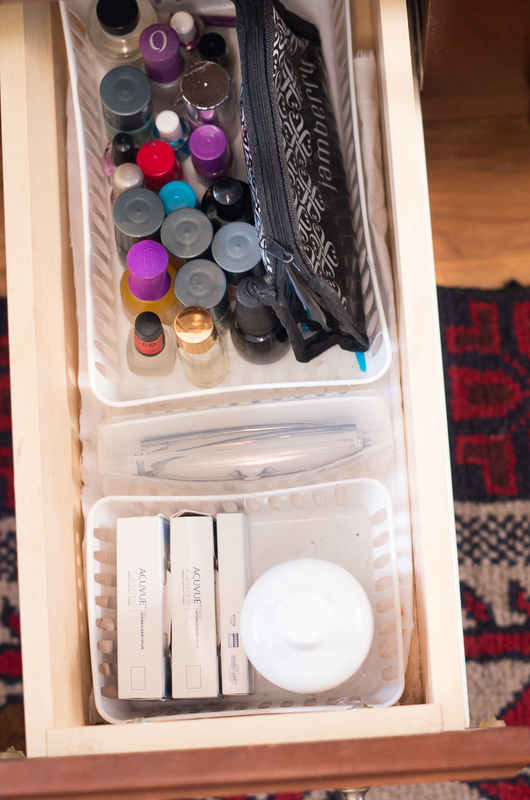 Divide and concur that space by adding smaller drawers. 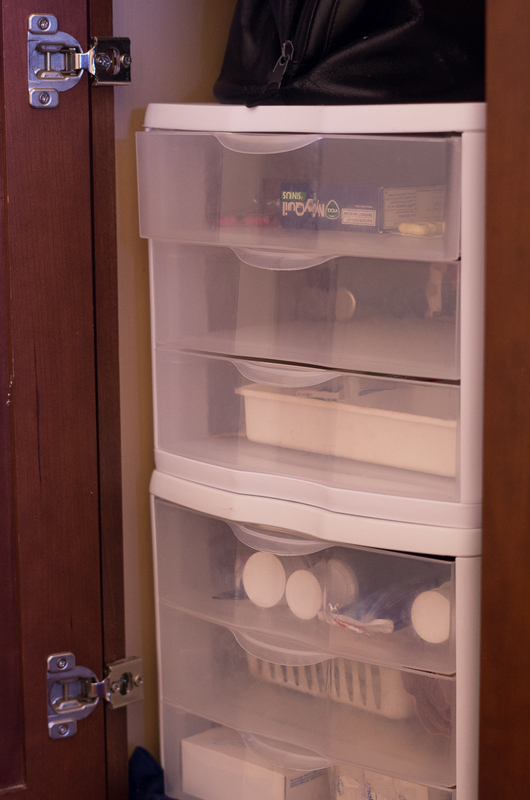 Instead of cramming all our first aid supplies and medicine into the small medicine cabinet, I added these plastic storage drawers under the sink. This makes it much easier to locate specific products quickly. I also separated my makeup and hair supplies into smaller drawers. *Important note: If you choose to store medicine or other hazardous products under the sink, be sure to add child locks to protect any little ones who may make their way into your bathroom. 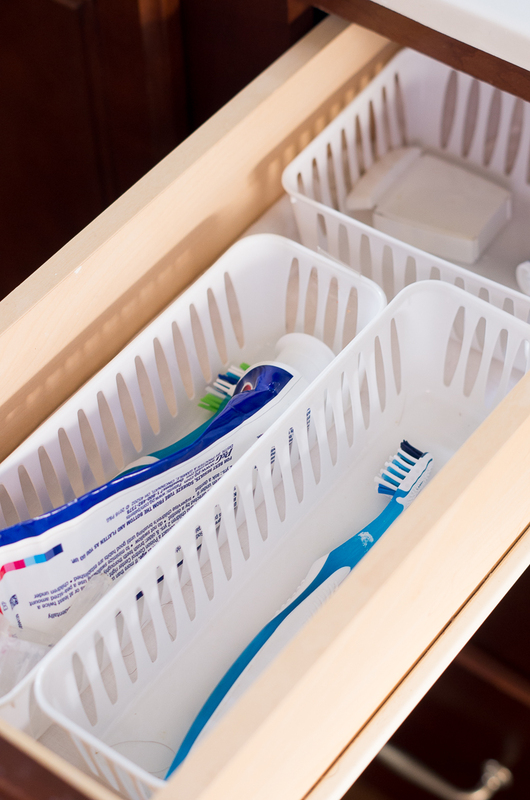 Separate small, loose items in large drawers by using smaller bins and baskets. When everything has a designated spot, returning them to their correct place while on the go is easier. That means the bathroom will stay in order longer with less effort. Win! Removable hooks are another great way to organize the bath clutter. Add some small hooks inside of cabinets for a convenient place to store necklaces. Hooks are also helpful for adding some more useful storage on the inside of cabinet doors. Here I cut up a plastic shoe organizer and hung it on the inside of the door. 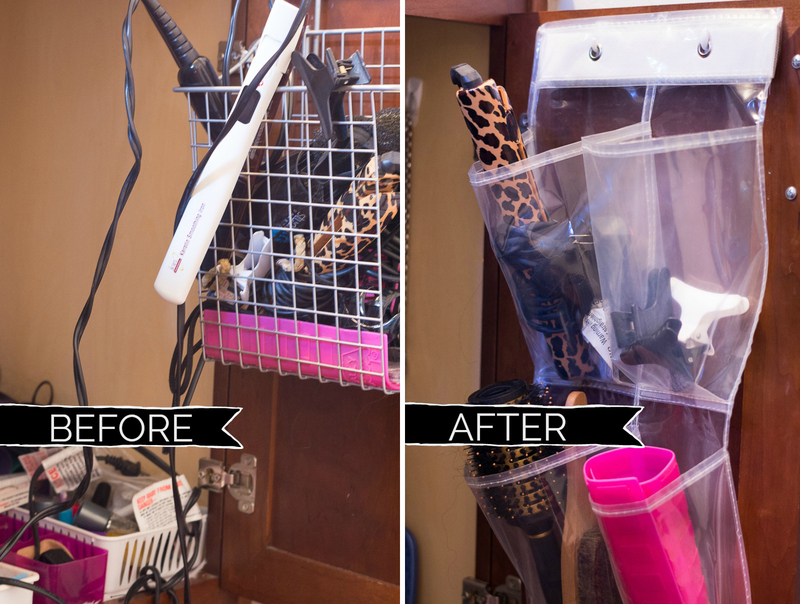 Now it’s the perfect place to store small hair appliances like a curling iron, a flat iron and hair brushes. Think outside the bin, drawer or cabinet. Here are some solutions I came up with to solve some specific issues. Apothecary jars are a great way to hide your clutter in plain view. They can make the mundane look marvelous. 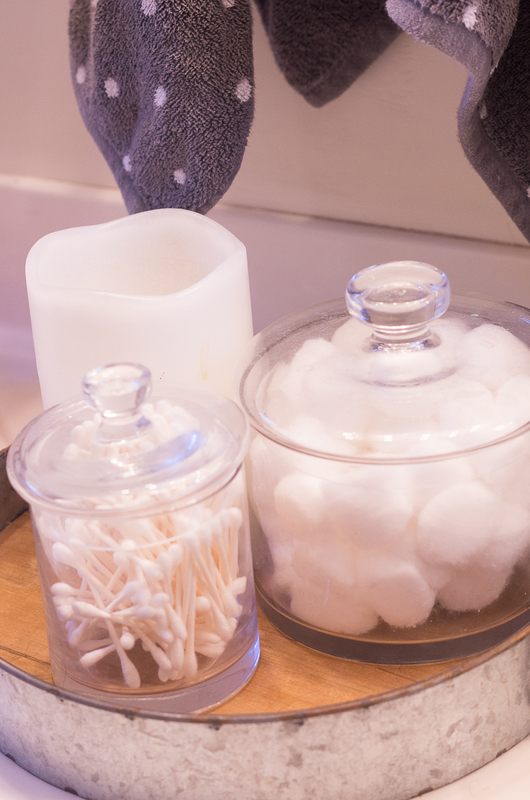 In my bathroom I store cotton balls and Q-tips in glass jars. You could also store extra soaps or lotions in a guest bath to give a hotel luxury feel for your visitors. 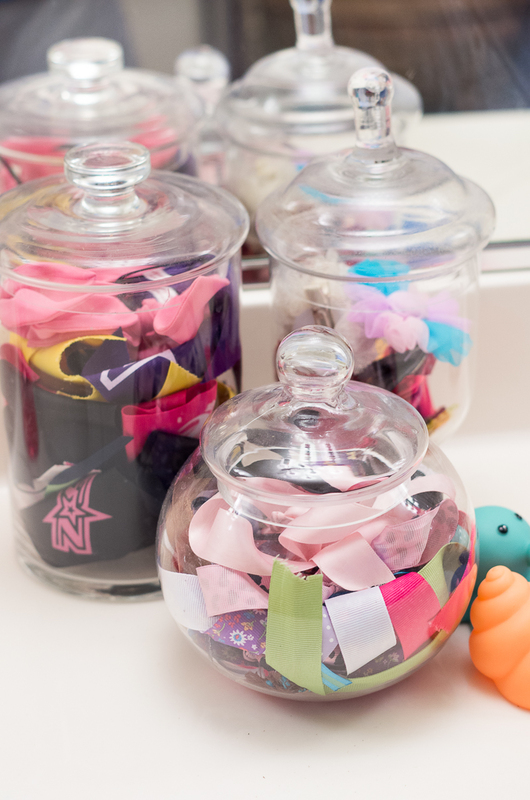 In the kids’ bath I am using some of the same kind of jars to keep clips, headbands and ribbons in check. Lindsey from Whimsy Girl gathers her bathroom knick-knacks in a tiered tray for a stylish display. Similar to a tiered tray, a small caddy is a great way to keep kids’ hair supplies, toiletries or cleaners. If you have older kids in your home, this would be a useful solution for storage for multiple teens who are all using different toiletries. Designate one caddy per person. When the supplies inside are done being used, all you have to do is grab the handle and stick it under the sink out of view. In a home with all girls, we have plenty of hair accessories to organize. This old round canister placed in a drawer keeps our headbands in order and handy. 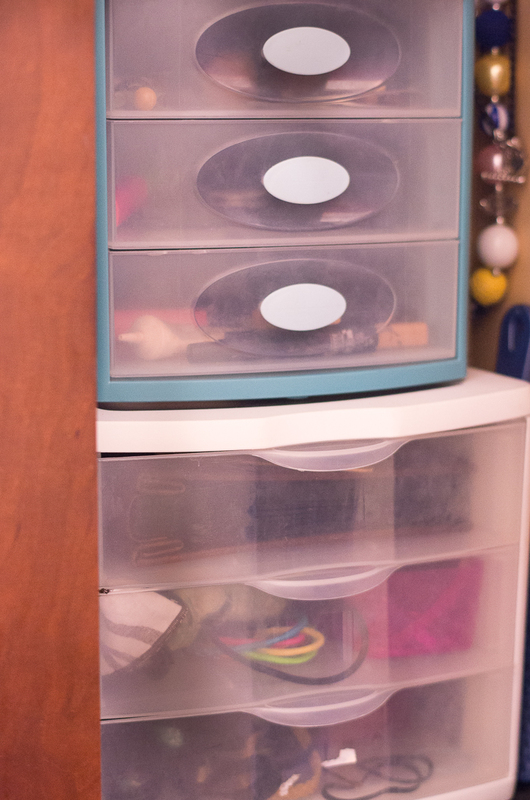 We also added a small tension rod in a cabinet to keep necklaces organized and easily accessible. Simple! Linen closet storage… Somehow in my own home we lack it. I’ve always loved how Kelley Nan from kelleynan.com organizes her bathroom closet. I tried to make my own version by add extra shelves and cabinets right in my bathroom. Since we have no closet storage in any bathrooms, adding some extra shelving is helpful for us. These shelves are the perfect spot for extra folded towels and accessories. We also keep washcloths in the belly basket and the bin on the bottom is extra storage for my hair tools, like a big hair dryer and hot rollers. We keep a wire basket full of extra toilet paper near the toilet. Baskets are also the perfect spot for extra towels and washcloths. They’re such an easy way to keep things organized, while also providing an attractive storage solution. You can never have too many. Maximizing the space in your bathroom just takes a little imagination and some tools to keep all your supplies in order. You also want all the solutions to be handy in helping ease your daily routine. It may take some trial and error and especially some upkeep, but an organized bathroom is easier to keep clean and useful. We hope these ideas help you get your bathroom in order and looking great! Are there some ideas we missed? Please share with us and our community in the comments below! I am a stay at home mom to 3 wild, courageous girls. Married to my best friend. A Midwesterner at heart; living in the South West. I enjoy shopping (too much), a DIY project, and singing or rapping in my car like no one is watching. I want to be an adventurous traveler, but these days you will most likely find me snuggled in bed watching a scandalous hour long drama.